Women who have this face, apply blush should start from the top of the cheekbone to a little above where it sinks cheek. Then extends forward to take a slight angle just below the outer edge of the iris of the eye, which serves as a benchmark to determine how far it should extend the blush on the cheek. Use a more vibrant on the cheek bone and forehead, nose and chin. 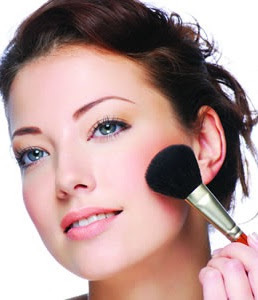 If you want to highlight the cheekbones, do not use darker blush to contour. To shape and sharpen your face, use powder blush a shade darker than your skin and apply under the cheekbone vertically, then pull the ear until it ends, look to spread it well so as not to notice the strokes. smiling in the mirror, and the most prominent parts of your face, with the help of a thick bristle brush, apply a vibrant blush color, drawing a broad crescent below the cheek bone and take it to the top of the cheek. If your forehead is a bit broad, dark shadow applied to the sides until the end of the eyebrows, gently fading blush to not notice the divider lines.